SureFire WARCOMP-556 Flash Hider Directionally-Controlled 5.56mm Flash Hider/Suppressor Mount for Better Recoil Management and Faster Split Times: 99% Flash Elimination! (Video!) | DefenseReview.com (DR): An online tactical technology and military defense technology magazine with particular focus on the latest and greatest tactical firearms news (tactical gun news), tactical gear news and tactical shooting news. 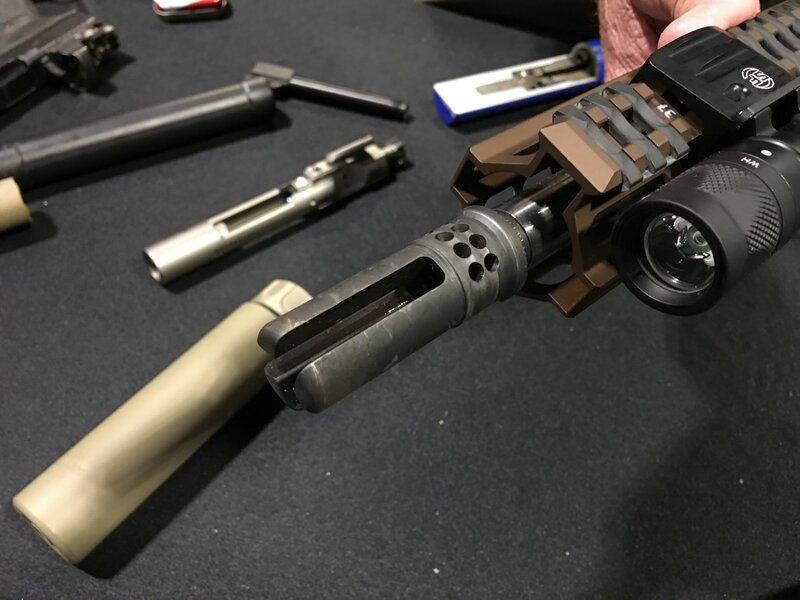 As it happens, the SureFire Optimized Bolt Carrier-Long Stroke (OBC-LS) Drop-In BCG and H7S Buffer System (with longer action spring) wasn’t the only new and very interesting SureFire product Barry Duke showed DefenseReview (DR) at SOFIC (Special Operations Forces Industry Conference) 2016. 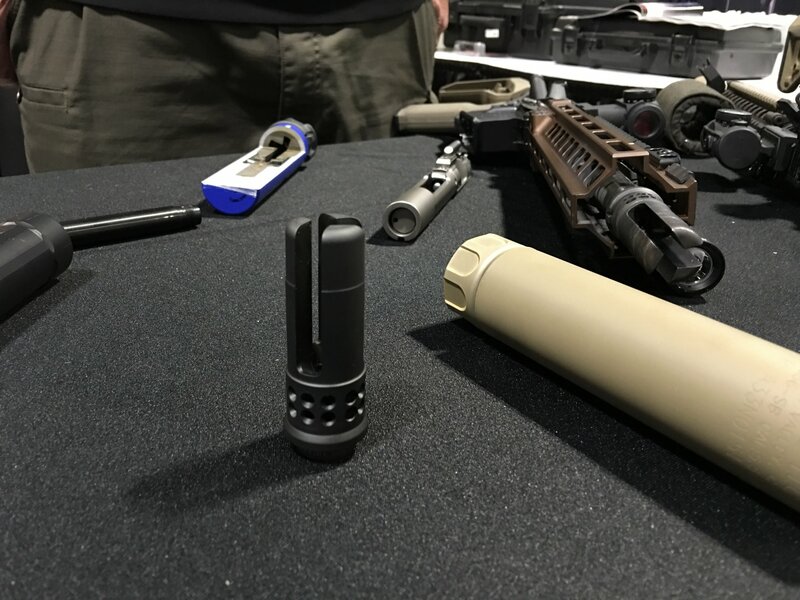 He also showed us the new SureFire WARCOMP-556-1/2-28 Flash Hider/Suppressor Mount, a directionally-controlled 5.56mm NATO tactical AR-15/M4/M4A1 Carbine/SBR (Short Barreled Rifle) flash hider/suppressor mount that’s designed to aid in recoil management while simultaneously reducing muzzle flash signature by 99% and providing a “rock-solid” silencer/sound suppressor mounting platform, according to the company literature on it. The SureFire WARCOMP-556 Flash Hider/Suppressor Mount vents gas out the top and the side, thus the directionally-ccontroled flash-hiding aspect. “Your sights stay trackin’ the target. Your muzzle doesn’t go high right. It goes straight to the rear. It’s not a muzzle brake. It’s takin’ off 5 or 10% of the recoil. But, the reality, what it’s doin’, it feels like a brake to most shooters because the weapon’s still not movin’. It’s stayin’ on target. 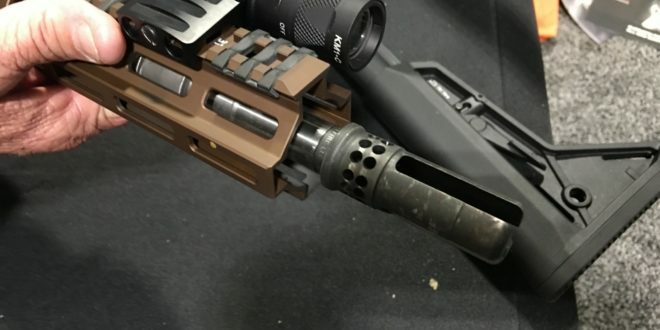 So, my personal split times, I can take off 50% shot-to-shot, ya’ know, just by usin’ a WARCOMP over a regular flash hider without the concussion comin’ off the sides. Flame-wise this is 98%-plus flash elimination. It’s almost invisible when you shoot it, yet your sights still track the target without the concussion, and, so far, I haven’t had any customer on the military side not want it,” said Duke. Wow, sounds pretty good. The WARCOMP-556 also looks good, which is the other half of the battle. Guys want AR parts/components that look good on their gun(s). That’s just a fact. 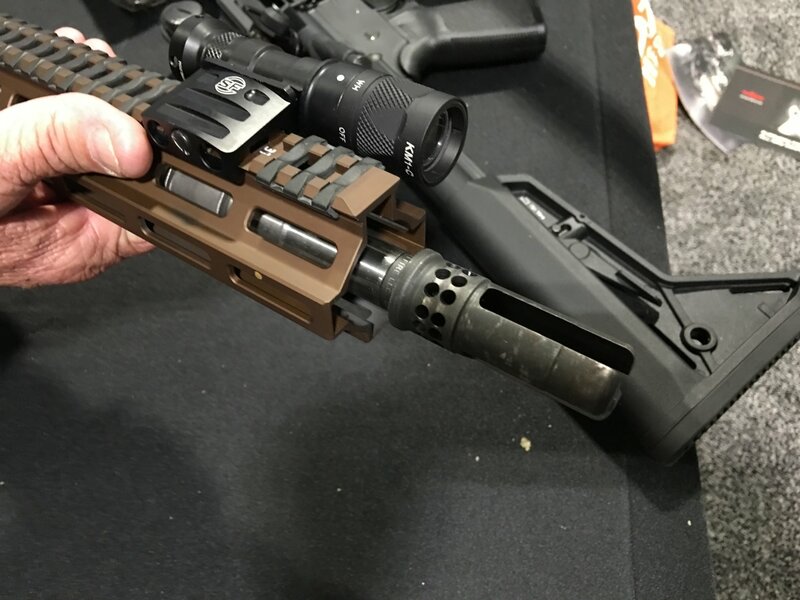 Anyway, the SureFire WARCOMP-556 Flash Hider/Suppressor Mount currently retails at $149.00 USD MSRP, and it goes without saying that Defense Review would very much like to get ahold of one or two of these to run on our tactical AR (AR-15) carbines/SBR’s as soon as possible for an actual hands-on T&E (Test and Evaluation) and review.